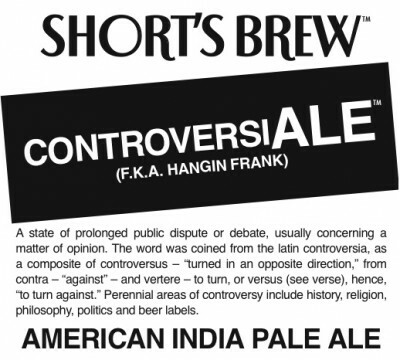 "Short’s spring seasonal, ControversiALE, is back! Formerly known as Hangin’ Frank, ControversiALE is an IPA with light, refreshing qualities perfect for springtime enjoyment. Over the years, ControversiALE has become one of our most popular beers. If you’ve never tried a ControversiALE, it is our tribute to Simcoe hops. In ControversiALE, ample additions of Simcoe provide an earthy, citrus, and pine-laced nose that is instantly detectable and completely delicious. Large amounts of toasted grains and high alpha hops form a perfect union that creates the cool sensation of toasted sourdough and zesty grapefruit. ControversiALE comes in at 6% ABV and 67 IBU. ControversiALE makes its way to some store shelves today, and will reach statewide within a week. It will be available through the end of May. Looking for a little bit more Controversi in your ALE? You’re in luck because this year we’ve decided to release the first ever DOUBLE ContoversiALE at our Anniversary Party. Akin to last year’s release of Aww Jeah (Huma x2), Contoversius Maximus will be sure to excite any IPA lover, and particularly our ControversiALE fans. Look for ControversiALE in stores soon. Keep an eye out for more details about our April 27th Anniversary Party for more details about the release of Controversius Maximus."